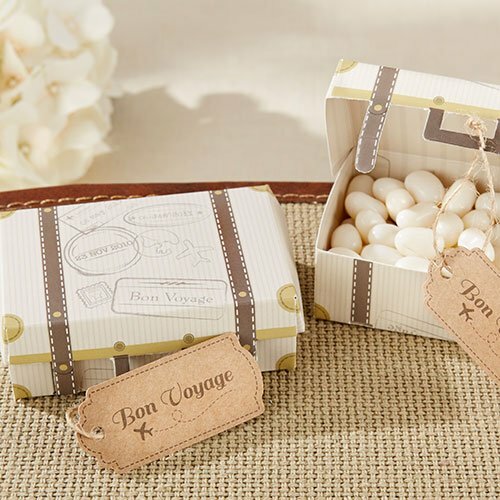 Send your guests home with a sweet memento from your wedding. These pocket sized mint tins are personalized with a custom printed label with your choice of exclusive, romantic designs. Add your names and the date of your wedding and this favor becomes a reminder of your wedding for all who attended. You may even submit your own photo for the photo dots design! Mint tins come filled with your choice of candy. 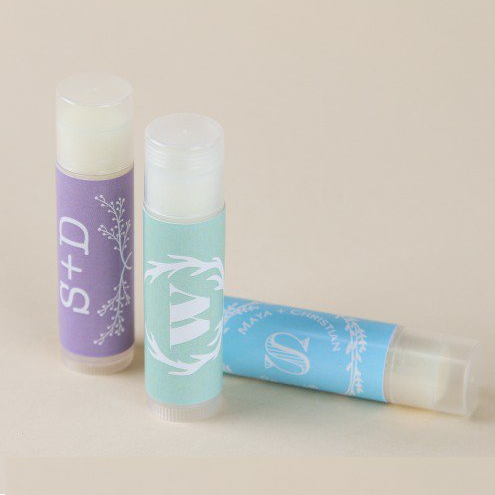 A perfect pout starts with these picture-perfect personalized lip balm party favors. Take your pick of our chic label designs for your wedding, bridal shower, anniversary, and other themed events—you can even customize select styles with your favorite photo! 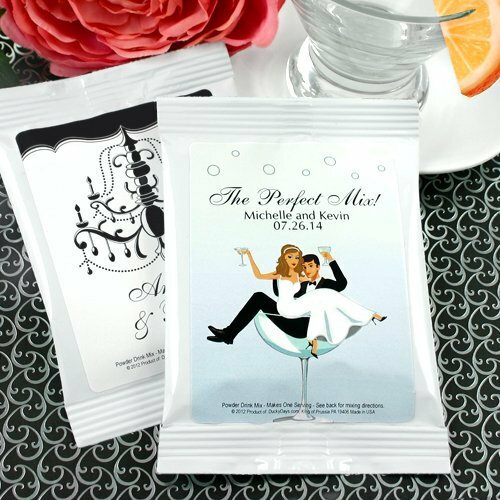 Couples can give their guests a fun and unique favor with personalized packages of cocktail drink mix! Choose from non-alcoholic mixes of margarita or cosmopolitan and select from a variety of designs. Proclaim your love on every door and wall with these custom printed wedding banners. They’re great for wedding ceremonies, wedding receptions and engagement parties. 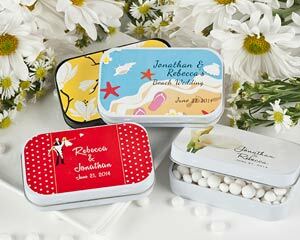 Bring a little light and personality to your wedding or bridal shower with themed personalized wedding matchboxes. Each matchbox comes with your choice of a white or black sleeve and a variety of amazing designs to suit your unique wedding style. 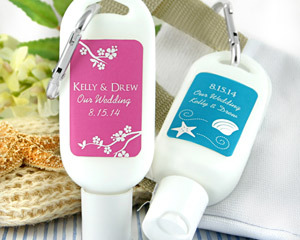 Customize your favors with your names and date, or even a special message for your wedding or bridal shower guests! 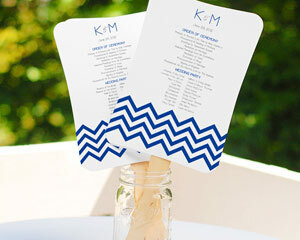 A wedding program fan serves as a great comfort for guests at an outdoor wedding. Who wouldn’t be a “fan” of these gorgeous programs? Doing triple duty as an informative wedding program, a personal fan to keep the heat at bay, and an extra element of gorgeous wedding decor, these fully customizable fan programs are the perfect way to welcome guests to your wedding and showcase your creativity. Multiple design templates available! Check out what the kit includes. Sunny protection for your sunny celebration! Terrific for tropical destination weddings, weekend guest bags, beach barbecues, or any outdoor gathering or event, this personalized bottle of SPF 30 sunscreen makes sure everyone is safe outdoors. Nourishing skin with organic aloe vera, vitamin E and sunflower oil, this personalized sunscreen wedding favor really knows how to take care of sun-exposed skin. The perfect carry-along, it can be easily attached to bags and even belt loops with the convenient carabiner clip. Each refillable bottle measures approximately 1 3/4″w x 4 1/2″h and contains 1.5 ounces of fresh, tropical scented sunscreen. SPF 30 with Organic Aloe Vera and Vitamin E, PABA-free. Convenient and Fun Carabiner Clip on this travel size 1.5 oz Bottle. Several label designs and colors to choose from. Personalization: maximum characters per line including spaces; Line 1: 14, Line 2: 16, Line 3: 16. At your wedding, you are royalty–the king and queen of hearts! 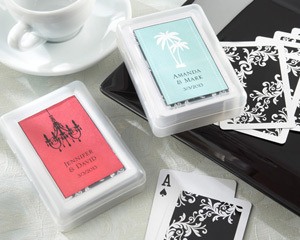 Here’s a personalized wedding favor that lets you deal a winning hand to your guests, and every time they shuffle the deck, they’ll think of you! 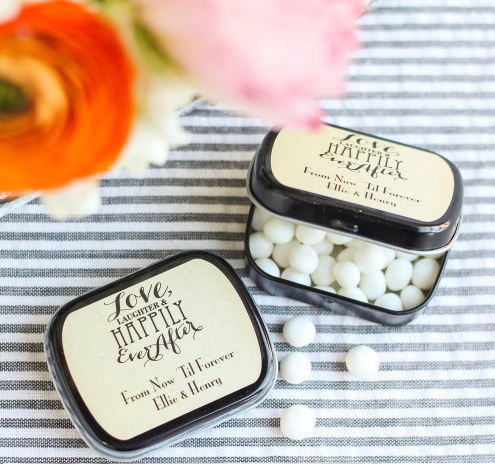 For a personalized wedding favor as special as you are, add your names and wedding date to one our our exclusive designs and create personalized wedding favor mint tins that are a wonderful reflection of you.